Three weeks have passed and with Oliver now firmly committed to his new role as Heir to the Demon, one task must be taken care of before any other - eliminate Ra's wayward daughter Nyssa Al Ghul! Nyssa is ready to face her fate alone, but Laurel is determined to help her and asks Diggle and Felicity to join in the fight. Five years ago in Hong Kong, Ollie and The Yamashiros try to slow the spread of the Alpha Omega virus as they race across Hong Kong to retrieve Akio. Batman: Son of the Demon (plot involving hero becoming Ra's Al Ghul's heir), Devin Grayson's Titans (mention of Damien Darkh), Gail Simone's Birds of Prey (the relationship between Laurel and Nyssa mirrors that between Dinah Lance and Lady Shiva) and Batman: Contagion (Ra's Al Ghul seeks to destroy a whole city with a plague). Despite the Lazarus Pit resurrection supposedly changing a person, Thea seems remarkably the same after three weeks. Where did Laurel get a tracking device from? It's been three weeks since they got back from Nanda Parbat and Felicity doesn't think to tell Thea that Roy is still alive and wants her to be with him in all that time? Come to think of it, why hasn't Roy called in the past three weeks asking about Thea? Wouldn't it have been nice if Laurel had used The Canary Cry at any point during the fight with the League of Assassins once Lyla was free? Like right after Lyla was turning to grab the guns from Felicity and all the assassins were in a nice line in front of her? Katrina Law gives a masterful performance and proves to be the best thing about an incredibly weak episode. Willa Holland, as underutilized as she is in this episode, works miracles with what little she has to work with. Given how controlled he usually is as John Diggle, it is a thing of wonder to see him lose control and grow truly angry with Laurel and Nyssa after Lyla's kidnapping. 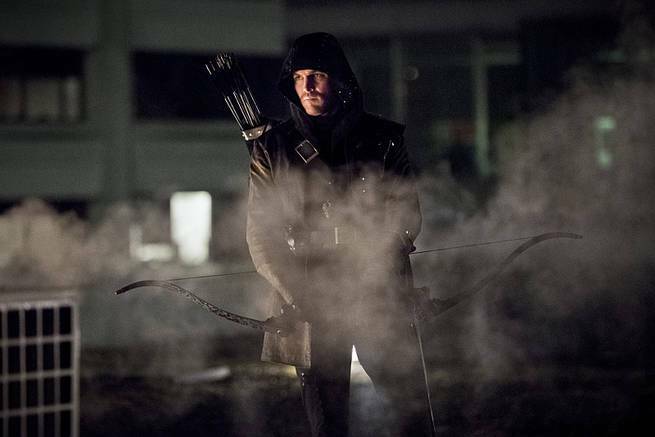 The show opens with a special opening, noting Oliver Queen is no longer the Arrow or Oliver Queen. Ra's Al Ghul makes reference to a former friend turned rival named Damien Darhk, who founded his own organization to compete with The League of Assassins and stole water from The Lazarus Pit. In the comics, Damien Darhk was a criminal mastermind who founded the second incarnation of the criminal group H.I.V.E. Darhk was a computer genius and also gifted with some form of immortality. The League of Assassins use an intensive brainwashing technique on some of their new recruits. Part of this includes the use of an herb that causes the conscience of the one who takes it to come to the forefont of their mind - usually their family, friends and mentors. In this case, Oliver hallucinates John Diggle. Oliver: My name was Oliver Queen. For three years I worked to save my city. But to save my sister, I had to become someone else. I had to become... something else. Nyssa: Were I so inclined, I'd question why your first instinct is to always keep matters secret even after doing so cost you a relationship with your father. Thea: (walking into Ray's secret lab) Nice secret headquarters upgrade! Does Mr. Palmer know you guys are in here? Felicity: (flustered) Yes. He's out of town. How did you get in here? Thea: My dad's a super-villain. And you left your doors unlocked. Felicity: Thea, this might actually be the worst week ever for this conversation. Felicity: It's going to be fine. We're handling it. Thea: (pause) You are a terrible liar. Merlyn: What did you think he would be doing in The League of Assassins? Lyla: What happened to you? Johnny told me, but how could you become this? Al Sah-Him: Quiet. It will be over soon. Lyla: You know, when John's brother died, a part of him died too. His guilt and the emptiness from the loss outweighed everything. I tried my hardest to help him but no one seemed to be able to comfort him or fill that void. Until he met you. You gave him hope and purpose again! Thea: (half-growled) Get away from him or the next one goes in your eye! Laurel: I know you're furious with Ra's for what he's done to Oliver. We all are. But Nyssa... she saved my sister's life. She gave her a home She's a good person. In spite of everything she grew up with. And the last time I checked, protecting good people is what we do. In universe, three weeks have passed since the end of the last episode and the start of this one. Ra's Al Ghul says that Damien Darhk was responsible for a number of crimes Oliver Queen or his associates stopped. He was the one who tried to buy Malcolm Merlyn's spare earthquake generator (212), gave the Afghan drug lord Gholem Qadie safe passage to Markovia (216) and hired Mark Shaw to steal a secret file from ARGUS (303). Laurel loves black-and-white milkshakes and dipping her fries in them. Nyssa proved a talented thief as a child. The League of Assassins came into possession of the Alpha/Omega bio-weapon sometime after it was released in Hong Kong. Nyssa Al Ghul stole it when she left The League but Ra's recovers it from a hidden compartment in her sword. Ra's Al Ghul declares that Nyssa shall marry Al Sah-Him as a sign of unity between their families. In the flashback, Akio Yamashiro shows signs of having the Alpha/Omega virus despite having taking the vaccine. The final act of ascension before a member of The League of Assasins can become Ra's Al Ghul is for their home city to be destroyed by their hand. In this case, Ra's decrees that the Alpha/Omega virus will be released on Starling City. Laurel would have been stabbed to death by a random mugger had it not been for Nyssa's timely intervention. Laurel's idiocy regarding Nyssa Al Ghul being "a good person" beggars belief. Thank goodness Diggle calls her on it. Lyla is turned into a damsel in distress for the sake of the plot, though at least she takes Ollie to task while she's being held hostage and acquits herself well in the fight that follows. Quite possibly the single worst episode of the series, redeemed only by the strength of the supporting cast and some good character scenes. The flashback sequences are pointless filler - well, more so than has usually been the case for this season. Laurel continues to be a puzzle piece that will not fit no matter how they twist her. The only person interested in trying to talk to Oliver without pointing a gun or a bow at him at the same time is Lyla of all people. And the less about the script and how Ra's Al Ghul has shifted gears over the course of one episode the better. Without Stephen Amell at the core of the show, it proves to be as empty and soulless as Al Sah-Him.